There are a plethora of front ends available for various emulators and games, and they have a variety of features, plusses and minuses. For a comprehensive collection, check out the links on Mameworld and Zophar's. We'll touch on a few here of particular note to cabinet/control builders. Got a question on these or any other front-ends? Head to the Software forum! Emulaxian/fe-3darcade is a very complete and fully skinnable frontend that can launch just about anything. It features powerful and fully customizable search and filter functions to find games fast. What makes it unique besides the sheer number of media that it supports to make your skins are the menu styles it can use. Besides the normal listbox with screenshots/cab layout you have a game like menu were you shoot at sprites to select menu items. And then there are the two virtual arcade interfaces were you can walk around in rooms filled with 3d models of cabs, select mp3's on a working jukebox and watch some movies on a movie screen. These arcades are also fully customizable...create your own personal arcade! From their web site - AdvanceMENU is a GNU/Linux, DOS and Windows front-end for AdvanceMAME, MAME, MESS, RAINE and any other emulator. Simply download and run. Copy the executable and run it. Auto update of the rom info. Support for any TV/Arcade Monitor like AdvanceMAME but it's good also for a normal PC monitor. Static and Animated image preview (PNG/PCX/ICO/MNG). Up to 192 images at the same time! Sound preview. (MP3/WAV). You can select a special sound for every game played when the cursor move on it. Sound backgrounds (MP3/WAV). Play your favourite songs or radio records in background. Support for zipped images and sounds archives. Screensaver. A slide show of the game images. PartyOn!, a win95/98/NT program that uses solely the ArcadePC's joysticks and buttons (same as their HotRod joystick, which is very mame-compatible). MAMEWah is an ArcadeOS inspired frontend for DOS or Windows M.A.M.E. under Windows 98/ME/2000/XP. MAMEWah is designed to hide the Windows environment and also to be controlled purely by arcade controllers like the great HotRod, X-Arcade or SlikStik. Or perhaps you've built or want to build your own. Originally intended for just M.A.M.E., multiple emulator support is also now supported. Game Launcher is a cross platform, universal front end for emulators. The main goal is to provide a user interface that is easy to use and attractive, yet does not look like a traditional user interface with windows and such. Game Launcher should work with any emulator. It has been known to work with MAME, Nesticle, RockNES, zSNES, snes9x, Callus, Stella, z26, and Genecyst. Game Launcher will run on DOS, Windows, and Unix. Version 0.9.8 is the current version. Very flexible. It should run with any command line emulator. Plays music in the background (MP3s or an audio CD). Displays screenshots (PNG, PCX, BMP, and JPEG). Support for vertical (rotated) monitors. ArcadeFX is my interpretation of almost everything I want in a MAME front-end that runs under Windows with a PC monitor. I wanted something that looked as good, if not better, than any game. I did not want it to look like a standard Windows application develped with C++ or VB. I wanted it to be very eye pleasing. Key Mapping for all non admin features. Marquee and flyer change as you scroll through games. If no marquee is available then MAME flyer is displayed. If no flyer is available then ArcadeFX flyer is displayed. Display shows n of n game below currently selected game. Letter/Number of current position is displayed above currently selected game. Current configurable options include Rotate Left/Right, Flip x/y, Maximize, Scan Lines,Triple Buffer, Controller: HotRod SE, Mouse, Joystick, and Sound on/off. You can make your own skins for the UI. Template is available on the download site. 13 categories let you sort your roms for easy access. Rom Maintenance feature lets you move/copy/delete roms from/to any category. Clicking the ArcadeFX logo in the upper right corner show hidden admin options. These require keyboard access and include: Mame Configuration, Rom Maintenance, Batch Rom Organizer, Skin Selection, Custom Keys, AFX Cinema, JukeboxFX, Help, Restart, Quit AFX. -EmuTron is a multi -emulator Front End for Windows. It has been tested with several versions of MAME and the Z26 Atari 2600 emulators. How is this any better than any other Front End? EmuTron is a scriptable Front End, It is highly configurable. You can choose to display any image, anywhere, anytime you want. There is user drawing code, Startup routine code, User defined routines&ldots; The scripting language is documented, and you can use the etscript.doc file as a reference for writing your own script files using a text editor. The easiest way to get started is to modify the mame.cfg script file I have included to pointed to your mame path and image paths. I plan to release a few more script "Skin" files soon. After coding all this, I realized the enormous task writing a front end can be. Configuration is not as simple as I had hoped, but there's always a tradeoff between flexability and complexity. I'm currently coding a Wizard that write the scripts for you, you just need to specify what you want to see and where, along with the keycodes/ joycodes/ mousecode to make everything happen. Hopefully it will be released soon. 0, 90, 180, 270 degree rotation! I would put a description here, but can't download the software from the web site because it rejects my anti-pop-up ad software. Anyone want to volunteer? The most up to date list of jukebox software will be found on the wiki and/or this message thread. This link left for posterity. An emulator is a program that mimics a piece of hardware or software on a different system than it originally was designed for. 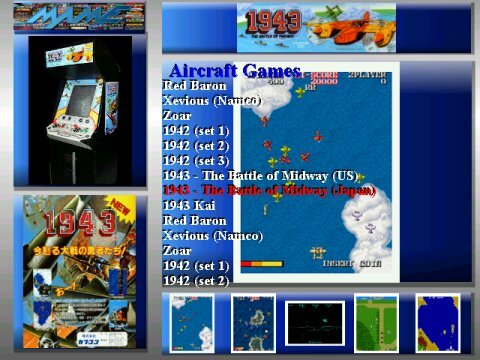 One of the best known examples is the MAME emulator that emulates real arcade games on your computer. It's also probably the reason you've found your way here. The emulation world is a fast changing and sometimes complex one, and is beyond the intent and ability of this web site to adequately deal with. However there are some excellent places on the web where you can find out more about emulators and get assistance with them. Here you will find a collection of them to get you started. BYOAC Message Boards - The software forum here is a decent place to ask for help. The Joystick Control Centre is powerful new software that enables you to program the buttons on your joystick, throttle or yoke connected to the games port of your computer. Each joystick button can be programmed with up to 6 keystrokes. Furthermore, this software introduces a unique concept that allows virtual buttons to be programmed. Using "modes" you can actually program more buttons than you really have. For example, if your joystick has 4 buttons and you decide to use 5 "modes", you immediately have a total of 20 buttons to use and program. The different "modes" are switched on the fly by either a user defined joystick button or a user-defined keystroke. Web site is defunct, but you can use the Internet Archive mirror above. I have a copy of the last version of the software I know of available for download as well.